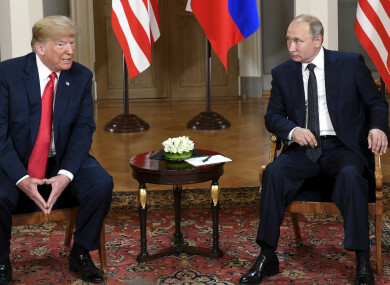 Trump and Putin at a meeting in Helsinki. PRESIDENT VLADIMIR PUTIN has said Russia is suspending its participation in a key Cold War-era missile treaty in a mirror response to a US move the day yesterday, agencies reported. President Donald Trump yesterday that Washington was suspending its obligations under the INF treaty and starting a process to withdraw in six months. Putin has also said that if Washington moved to place more missiles in Europe after ditching the deal, Russia would respond “in kind” and that any European countries agreeing to host US missiles would be at risk of a Russian attack. Email “Russia is now pulling out of a key nuclear weapons treaty after the US did so first”. Feedback on “Russia is now pulling out of a key nuclear weapons treaty after the US did so first”.